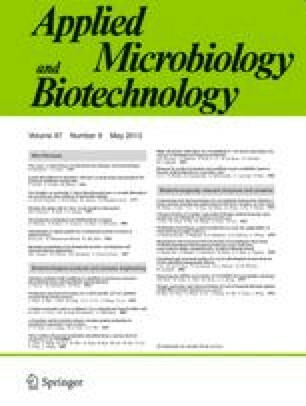 The production of glucogenic amylase from the thermophilic fungus Thermomyces lanuginosus was studied in shake flasks and laboratory fermentors. As conidia were not able to germinate in media without yeast extract, pregerminated conidia were applied as inoculum. By this procedure it was possible to use different NH inf4 sup+ salts as the sole source of nitrogen for growth and amylase formation in a synthetic medium. In pH-controlled fermentors a fourfold increase in the extracellular glucogenic amylase activity was obtained with (NH4)H2PO4 as the nitrogen source as compared with yeast extract. However, by fractionation of these activities, comparable yields of partially purified glucoamylases were obtained. The glucoamylase preparation from fermentations with either of the nitrogen sources had a temperature optimum at 70° C and showed similar thermal stability. By incubation without substrate at 60° C. 90% of the activity was still present after 5 h. At 70° C, 50% of the activity was retained after 30 min incubation.